When federal prosecutors indicted property owner Maria Valdes for conspiring to run a marijuana “grow house” in St. Lucie County in 2007, she turned to Coral Gables defense attorney Walter Reynoso for help. The alleged conspiracy involved multiple grow houses and a murder. Digging into the case, Reynoso was able to show that Valdes, a grandmother who was renting out the home, was unaware of the illegal operation. After many months of hard work, a U.S. District Court judge dismissed the indictment. All other defendants were convicted, with one receiving a 30-year prison sentence. 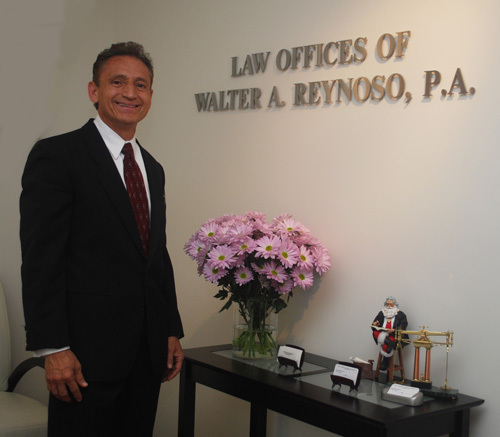 Since launching his criminal defense practice in 1986, Reynoso has successfully represented many high-profile clients over the years, including corporations, professional athletes, politicians, doctors, attorneys and lead defendants in major felony, drug and money laundering cases. A lifetime member of the National Association of Criminal Defense Lawyers and past president of the Colombian-American Bar Association, Reynoso focuses his practice on white-collar criminal defense and trials in federal courts. His brother Luis handles felony and misdemeanor matters in state courts. The two attorneys collaborate frequently in all their cases. Born in Colombia, Reynoso came to South Florida in 1963 when he was four years old. “My mom and dad taught me the value of hard work, and have inspired me through the years,” he says. That determination paid off — at Chaminade High School, he played football for four years, making the “All-Broward County” team as an outside linebacker. He was recently inducted into the school’s Sports Hall of Fame. From there, Reynoso enrolled at John Carroll University, where he continued to play football and was named defensive captain his senior year prior to earning a degree in business administration. At Boston College School of Law, he was a staff writer for the Boston College Uniform Commercial Code Reporter Digest and he worked for the Department of Justice, Securities and Exchange Commission, Enforcement Division. He also made “the best decision of my life,” by marrying Melanie, his wife of 25 years. Today, he and his wife have four children, Jenna, Kristen, Wally Jr., and Britney. Jenna attends Fordham Business School in New York; Kristen is in law school at Nova Southeastern University; Wally Jr. is a junior at the University of Alabama (Pre-Law Major) and Britney is a freshman at St. Thomas High School in Fort Lauderdale. “I spend a lot of my time with my family,” says Reynoso. “I also enjoy running 10K races, boating and exercising. I believe there has to be balance between your practice, enjoying your family and enjoying life. Success is achieved by finding that perfect balance. For me, every day is another day in paradise”. Reynoso also volunteers time by actively assisting the homeless of South Florida and sponsors Camillus House and Miami Rescue Mission. The law firm also runs a Law Mentor Program at local middle schools, where children take part in a mock trial by participating as prosecutors, defense attorneys and jurors. Reynoso and his family have received awards for their efforts in coordinating holiday parties and other events for the foster children of the Children’s Home Society. Reynoso’s career got off to a strong start, handling one jury trial after another. “I earned a good reputation among my peers within the legal system,” he says, recalling a long, hard-fought trial in an eight-defendant case that he won on all charges. Afterwards, John Schlesinger, then assistant U.S. attorney, complimented Reynoso in a letter, saying, “It was a pleasure working with you as an adversary in this trial. Of all the attorneys involved in this case, you stood out as one of the finest and certainly the fairest and most ethical opponent I faced.” Reynoso framed the letter with the verdict, one of many “not guilty” verdicts framed throughout his office. “The verdicts are great testimonials. Each verdict states that 12 jurors considered the evidence presented by the U.S government against each client, and found each client not guilty of the charges brought by the Federal Grand Jury,” he says. That focus is particularly important, Reynoso says, because there is a 90 percent conviction rate after a grand jury indicts someone. “I have obtained dismissals of five different indictments before trial — a rare occurrence. I’ve been able to do so through preparation, preparation and more preparation. I’ve been very lucky throughout my career, but my definition of luck is when preparation meets opportunity”.